If you are thinking about a vacation in the south of Spain, one would usually plan for the summertime, right? During the summer Sevillanos keep their cool by avoiding the midday sun and drinking their beer as cold as possible. However, admittedly sightseeing in hot temperatures is not the most pleasant thing to do for locals. It is fantastic for tourists wishing to secure some reliable sunshine. Andalusia has one of the warmest climates in Europe and luckily a short commute to some of the most pristine beaches. Even during December and January when the rest of Europe is facing an icy-breeze and winter coat, scarf and hat are a daily requirement to leave the house. The temperatures in Seville usually don’t go far below 20°C. The last time the city saw snow was in the 1930s and the snow stayed on the ground for about 30 minutes. So you definitely won’t freeze to death if you spend the whole day sightseeing and you will avoid the crowds. There will be no lines getting into institutions like the Museo de Bellas Artes or the Alcázar, for example. And don’t be fooled thinking you won’t get into the holiday spirit in these mild temperatures. 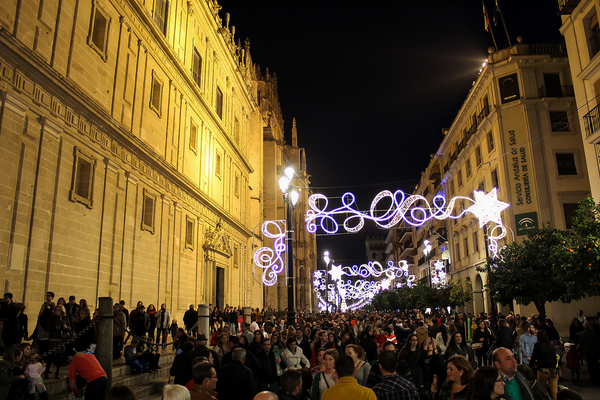 As a matter of fact, the Christmas market in Seville is among Spain’s most popular. 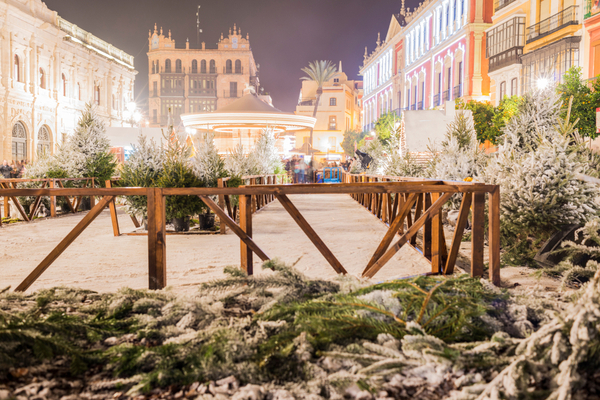 Though it is still a little early, there are some pre-Christmas markets that slowly but surely will get you in the right mood for the holidays. Starting in mid-November up until right before Christmas, the Feria del Belén de Sevilla put everything on display for the nativity scene. Famous stores from all over the country have booths at the fair and people can buy figures and everything else one needs for a nativity scene. Saint Mary (Seville Cathedral) Spain at Christmas. Also from mid-November until the beginning of December, another fair will open where people can buy new and old printed media. At the Feria del Libro Antiguo, you can browse for rare and antique posters, prints, books, newspapers etc. For those who are interested, this is a great place to buy titles about the history, art, and architecture in Seville. 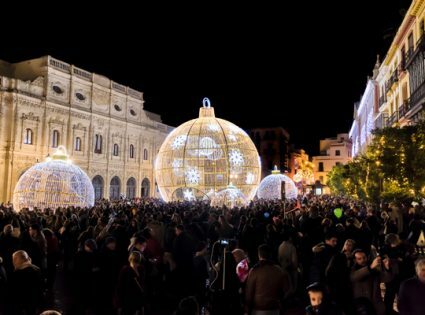 To enjoy a mild winter – at least for a little while – think about spending some time in apartments in Seville.